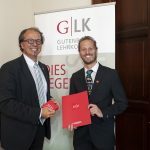 The Institute of Computer Science is glad to announce that Dr. Stefan Endler is among the award winners of this year’s Teaching Award of JGU.The award is bestowed for excellent performance in teaching in the framework of the Dies legendi which took place on 25 October 2018 in a ceremony in the Alte Mensa. Stefan who has been active also as a departmental advisor since the beginning of 2018, has achieved excellent results in teaching evaluations. Congratulations!